A couple of days ago I walked out to the end of the driveway to put some letters in the mailbox. There’s nothing unusual about that, but on the way back I heard a kitten crying. Since all we have is a neutered male cat, that WAS unusual. The trouble was, I could hear it plainly, but I couldn’t SEE it. I looked all over. Around the vehicles. Under the vehicles. In all sorts of nooks and crannies. I kept hearing these pitiful cries, but no matter how much I looked around, I couldn’t see this cat. That is, until I looked up. WAY up. 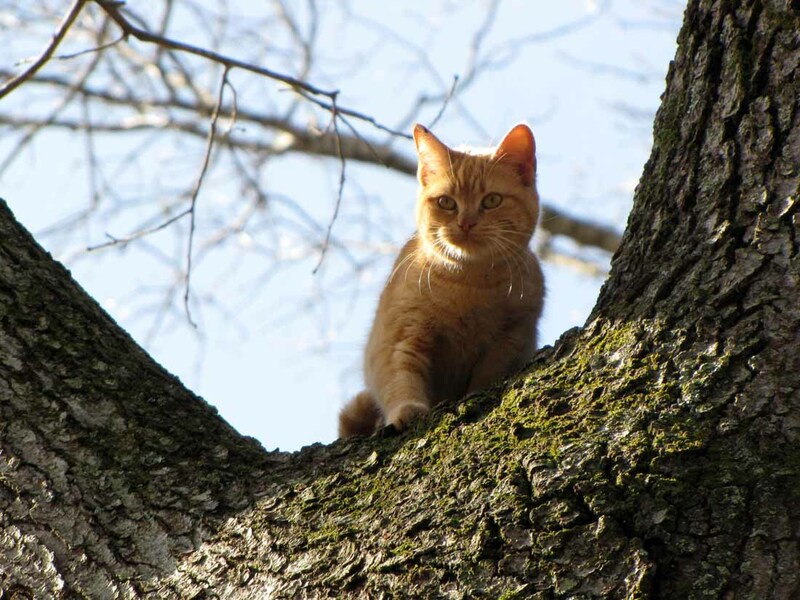 And there sitting in a fork of one of the large trees in our backyard was a half-grown orange cat. I don’t know if one of our dogs or one of the neighbor dogs chased her up the tree. Considering the location of the tree, it’s just as likely to have been the neighbor’s dog who thinks our front yard and driveway is part of her territory. 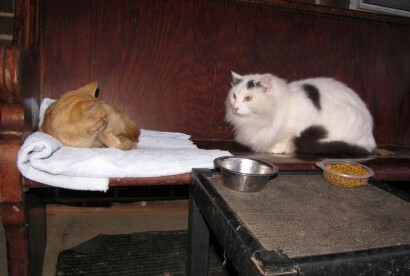 Since the Cave Geek was home, I went in to enlist his aide in cat rescue. He went and got the tallest ladder we have and put it up against the tree. The arrow points out the spot! 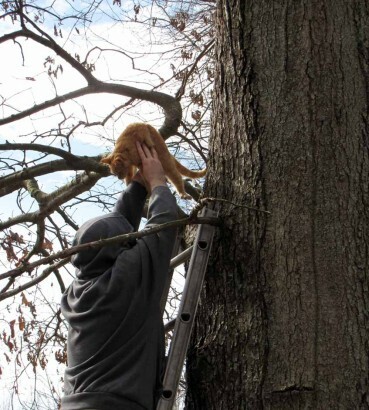 As you can see from the above picture, the ladder fell far short of the cat’s location in the tree. 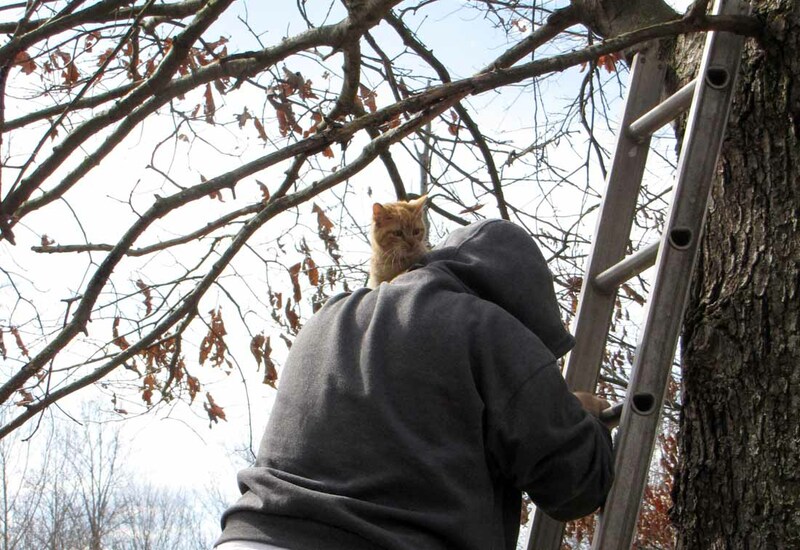 The Geek is tall, but even at the top of the ladder there was no way he could reach this cat. We considered our options. I got the net I use to catch chickens or peafowl, and put a long piece of pipe into the handle. With that, we could reach the cat. 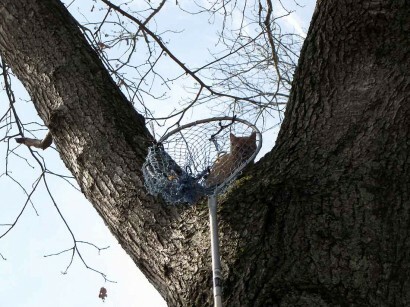 Net-A-Cat to the rescue! Or not. In theory, it was a good idea. But it didn’t work. There was no way to angle the net to scoop the cat into it. And the cat was not eager to jump into the net and kept backing away from it. We thought about throwing a rope between the big tree branch and the trunk of the tree, and a basket tied onto the end of the rope with some food in it to entice the cat. I don’t know if it would have worked because we couldn’t find a long enough piece of rope. The only other thing we could think of was to go buy a longer ladder. However, any ladder long enough to reach the cat would be an expensive purchase and no place near to buy one anyway. All during the time we were considering our options, the cat continued with the pitiful crying. I decided before we gave up, I’d try calling it again and see if it would climb down by itself. Wonder of wonders, the cat did indeed start to climb down. 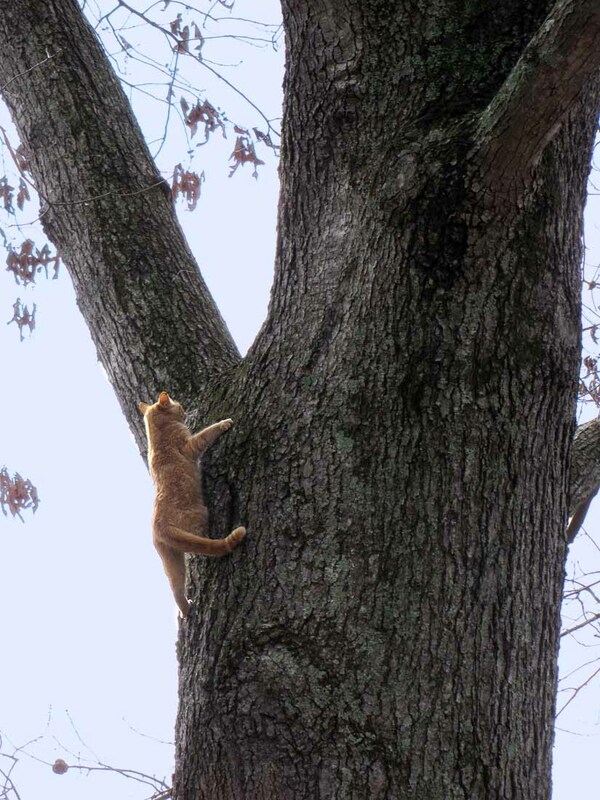 Now the cat wasn’t keen on climbing far, but got to the next branch down, which we could reach with the ladder. (It’s the branch to the left of the top of the ladder in the tree picture.) 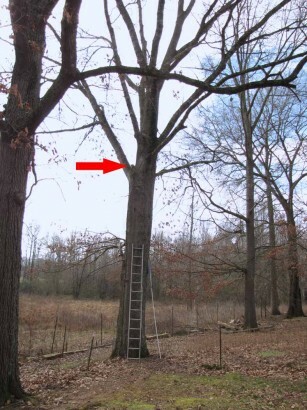 The Geek moved the ladder around under the branch, and went to the rescue. Once he had hold of the cat, it was content to stay tucked up against his neck and shoulder on the way down. I’m hanging tight to this guy! Once the cat was out of the tree, a little investigation uncovered the fact is was a girl cat. We took her around to the front porch to give her some cat food. She acted like she was starved to death, but couldn’t decide if she wanted to eat, purr or be petted. Our older cat, Spot, eventually came to investigate what was going on. 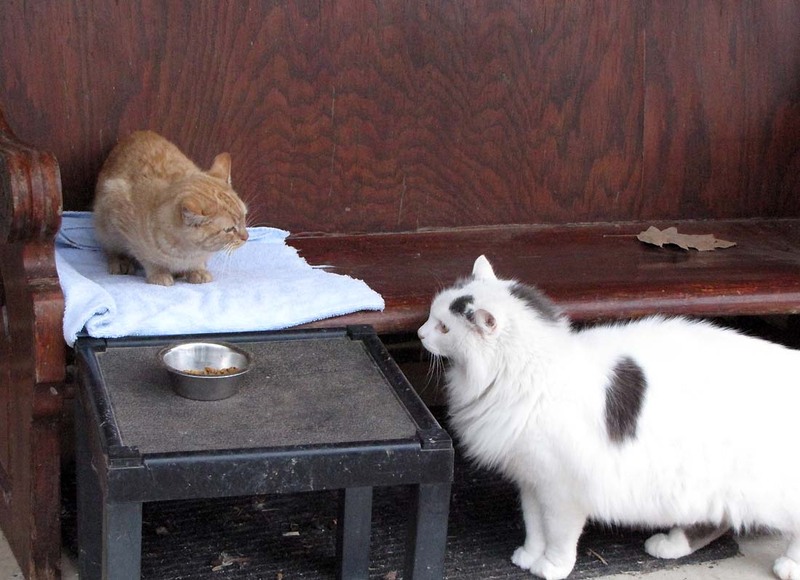 The kitten was not impressed with Spot, although he tried to get close little by little. You can hear her having hissy fits in the video below! He tried to play nice, but she wasn’t having it. This is about as close as he got. We’ll see if the newcomer decides to stick around. 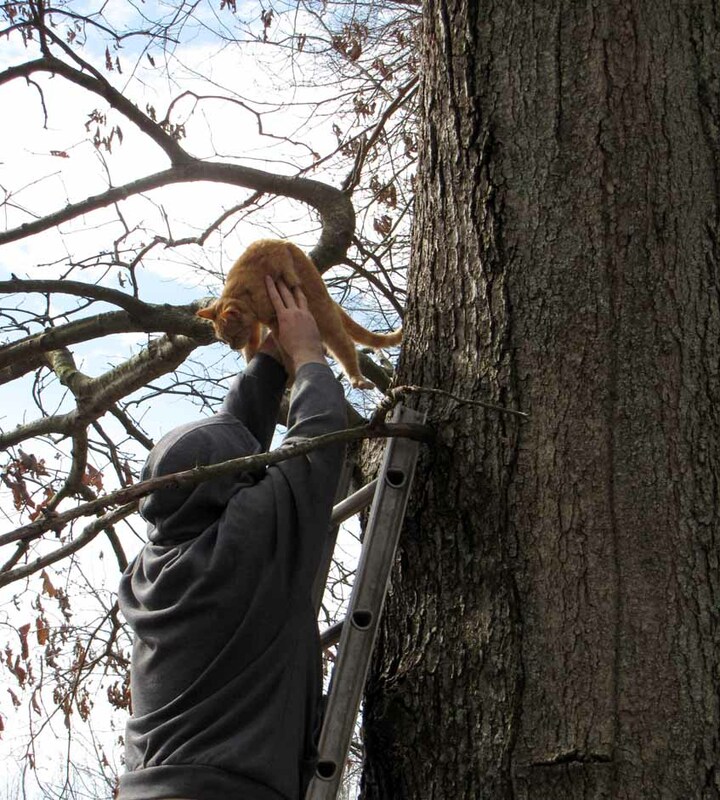 But it’s not every day we rescue a cat out of a tall tree! Thank goodness!